An envelope is a flat, flexible container, made of paper or similar material, that has a single opening and a flap that can be sealed over the opening. The envelope is usually sealed by wetting an area of the flap. Some envelopes are sealed with a metal fastener. Others are sealed with a piece of string that wraps around flat, circular pieces of cardboard attached to the envelope. A recent development in envelopes is a thin strip of plastic, which is removed to reveal an area of the flap with an adhesive that does not need moistening. Envelopes are almost always rectangular, but they exist in a wide range of sizes. The two main styles used are banker envelopes, which have the opening on the long side, and pocket envelopes, which have the opening on the short side. In the United States, standard sizes range from 3.5 x 6 in (89 × 152 mm) to 10 x 13 in (254 x 330 mm). In Europe, sizes range from 3.2 x 4.5 in (81 x 114 mm) to 11 x 15.75 in (280 x 400 mm). Sizes are somewhat different in the United Kingdom, with the most common being 4.25 x 8.625 in (108 x 219 mm). Some envelopes have one or more windows cut into the front to allow addresses written on sheets inside to be seen. These windows may be covered with a transparent material. The earliest ancestor of the envelope was used by the ancient Babylonians five or six thousand years ago. Messages were written on clay tablets, which were baked to harden them. The tablets were then covered with more clay and baked again. The inner tablet could only be revealed by breaking open the outer layer of clay, ensuring the security of the message. True envelopes did not exist until much later, long after the invention of paper. The oldest form of paper was papyrus, first manufactured by the ancient Egyptians at least as early as 3000 B.C. Papyrus was made from a fibrous material found within the woody stems of an aquatic, grassy plant (Cyperus papyrus). Long strips of this material were placed side by side, then covered with another layer of strips at right angles to the first. The sheet formed by the two layers was dampened, pressed, dried, flattened, then dried again. The resulting papyrus, if properly made, was pure white and free from spots and stains. An excellent writing material, papyrus was used extensively by the ancient Egyptians, Greeks, Romans, and Arabs. It continued to be used until paper made from other plant sources reached the rest of the world from China. Some papyrus was used in Europe as late as the twelfth century. Early forms of Chinese paper, made from reeds and rice, date back as far as 1200 B.C. A superior kind of paper, similar to modern paper, was first made about the year 105. Attributed to a court official named Ts'ai Lun, this improved paper was made from a mixture of materials, including mulberry and other woody fibers, hemp, rags, and fishing nets. Papermaking spread slowly from East to West, reaching Central Asia by 751 and Baghdad by 793. By the fourteenth century, there were several paper mills throughout Europe, particularly in Spain, Italy, France, and Germany. The development of the printing press in the 1450s greatly increased the demand for paper. The early history of the paper envelope is not known. Paper may have been used to wrap messages at a very early date in China. They did not appear in Europe until the seventeenth century, when they began to be used in Spain and France. Until that time, messages were simply folded and sealed. Even today, some stationery is designed to be folded and mailed without an envelope. Cotton and linen rags were the main raw materials used to make paper until the early nineteenth century, when they were replaced by wood. At about the same time, papermaking by hand began to be replaced by papermaking machines. The emerging envelope industry was noted by Karl Marx in his book Das Kapital in 1867. Envelope manufacturers continued to increase the speed of production, from three thousand envelopes per hour at the time of Marx to more than fifty thousand per hour in the late twentieth century. By the late 1990s, nearly two hundred billion envelopes were made in the United States each year. Most envelopes are made from paper. Some large, strong envelopes are made from synthetic materials, such as polyethylene. Polyethylene is a plastic made from ethylene, which is derived from petroleum. Paper used for most envelopes is made from wood. Modern technology allows the wood to come from almost any kind of tree. Paper used to make very high quality envelopes, such as those used to enclose formal invitations, may be made partly or completely from cotton or linen. Some envelopes are made from manila, a fiber from the leaves of a plant found in the Philippines that produces a strong, yellowish paper. Most so-called manila envelopes, however, are made of paper derived from wood which only resembles true manila. The glue applied to envelopes is of two basic types. The glue applied to the flap that is sealed by the consumer is usually a gum. A typical natural gum is gum arabic, derived from a substance produced by the acacia tree. Synthetic gums are often derived from dextrans, which are produced by the fermentation of sugar. The glue that holds the rest of the envelope must be stronger and more permanent. This glue is often derived from starches, which are obtained from corn, wheat, potatoes, rice, and other plants. The fastener attached to some envelopes is made of aluminum or other metals. The string attached to other envelopes is made of cotton or other fibers. The material covering the windows in some envelopes is usually polystyrene. Polystyrene is a plastic made from styrene, a derivative of petroleum. 1 Mechanical methods can be used to transform wood into pulp, but this produces a relatively weak paper that is used for newspapers and similar products. Paper intended to be used for envelopes is made from pulp obtained by chemical means. 2 The most common chemical method used to make wood into pulp is known as kraft pulping. Chips of wood are placed in a large, sealed container known as a digester. The digester contains a strongly alkaline solution of sodium hydroxide and sodium sulfide. The mixture is heated to a temperature between 320-356° F (160-180°C) at a pressure of about 116 pounds per square inch (800 kilopascals) for about one-half to two hours. 3 Various methods exist to bleach the resulting pulp. Bleaching removes lignin, a substance found in wood pulp that gives paper a brown color. In general, bleaching involves mixing the pulp with a series of oxidizing chemicals that react with the lignin. After each mixture, the pulp is washed with an alkaline solution that removes the treated lignin. Most paper used in the manufacture of envelopes is derived from wood. The wood is mechanically or chemically processed to produce pulp that is then poured on mesh screening and squeezed through rollers to remove the moisture. The formed sheets of paper move through a series of heated cylinders that dry the paper further. The sheets are then wound on reels. so that addresses written on the envelope in ink will not run and blur. 5 Pulp is added to water to form a very dilute slurry in order to make paper with an even density. The slurry is pumped onto a moving mesh screen. This screen is made up of very fine wires of metal or plastic. Water drains through the small openings in the mesh, forming a sheet of wet material from the slurry. Rapidly spinning rollers beneath the mesh create suction, a partial vacuum that removes more water from the mixture. 6 The sheet is moved on a belt made of felt containing wool and synthetic fibers. The felt absorbs water and prevents the sheet from being damaged as it moves between rollers, which squeeze out more water. The sheet then moves to a belt made of felt containing cotton and other fibers. This lighter felt allows water vapor to escape as the sheet is moved around a series of steam-heated rollers. As many as 40-70 rollers may be needed to dry the sheet. 7 The dried sheet moves between rollers known as calendars to make it smooth. It is then wound on a large reel. 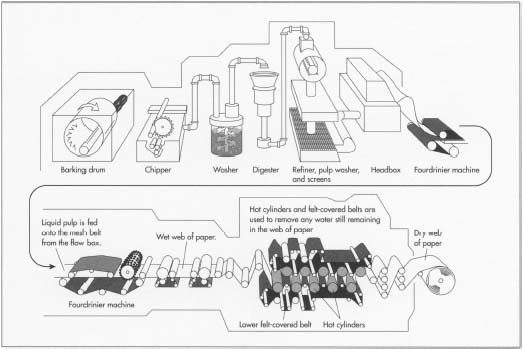 Variations in the papermaking process produce paper in a wide variety of basis weights. The basis weight of paper is the weight, in pounds, of a ream of 480 sheets cut to a size of 24 x 36 in (610 x 914 mm). Envelope paper usually has a basis weight between 16 and 40, with a basis weight of 24 being typical. Although many other kinds of paper are coated after being made, envelope paper is usually uncoated. Rolls of paper, typically weighing 220 lb (100 kg), are either cut before they enter the automated machine that makes the envelopes, or fed directly into the machine from the roll. Once cut, the sheets are stacked and cut into blanks. A blank has the shape of an envelope with its flaps opened and laid flat. Blanks are generally shaped like diamonds and are cut from the sheets in such a way as to minimize waste. If the roll is fed directly into the machine, it cuts the paper into blanks very quickly with sharp blades. The machine also folds the blanks into envelopes at a very rapid pace. Strong glue is also applied to the places which will hold the envelope together. A weaker glue is applied to the flap that will be sealed by the consumer. The machine then folds the blank to form the envelope. The completed envelopes are filled in cardboard boxes and shipped to retailers. blades into sheets of the proper size. The sheets are then stacked into large piles for further cutting. Strong blades then cut the pile of sheets into blanks. A blank has the shape of an envelope with its flaps opened and laid flat. Blanks are generally shaped like diamonds and are cut from the sheets in such a way as to minimize waste. If the roll is fed directly into the machine, it cuts the paper into blanks very quickly with sharp blades. 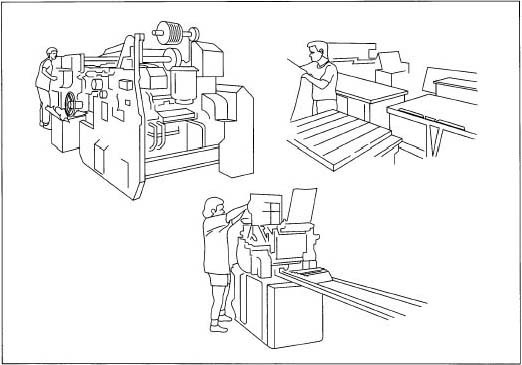 9 The machine performs all the operations needed to transform blanks into envelopes at a very rapid pace. Windows are cut if needed. If a transparent covering is needed for the windows, a strong glue is applied around them. The transparent material is then cut and glued in place. Strong glue is also applied to the places that will hold the envelope together. A weaker glue is applied to the flap that will be sealed by the consumer. The machine then folds the blank to form the envelope. Optional printing or fasteners are applied. The completed envelopes are filled in cardboard boxes and shipped to retailers. Modern envelope manufacturing is highly automated, and almost always results in a reliable product. Although constant testing is not necessary, certain factors are checked to ensure quality. Paper arriving at the factory is inspected to be sure that it has the correct weight. A very small number of sample envelopes are checked to ensure that they have the correct shape and size, and that adhesives have been applied in the correct places. Any printing that appears on the envelope must be in the correct position, of the correct color, and without printing errors. If any windows are cut in the envelope, they must have the correct dimensions and be in the correct position. Although major changes in envelope design are not expected, innovations are likely in the way paper is made. Manufacturers are constantly looking for ways to make paper that are more efficient, less costly, and result in less pollution. Genetic engineering may result in trees that grow faster and produce wood that is better adapted to producing pulp. A recent trend that is likely to continue is the increasing use of recycled paper as a raw material for making envelopes and other paper products. Biermann, Christopher J. Essentials of Pulping and Papermaking. New York: Academic Press, 1993. Ferguson, Kelly, ed. New Trends and Developments in Papermaking. Miller Freeman, 1994. Keman, Michael. "Pushing the Envelope." Smithsonian (October 1997): 30-31. Ohio Envelope Manufacturing Company. http://www.ohioenvelope.com/ (September 30, 1998). I was curious when the adhesive glue that you wet to close the envelope first came into effect? I didn't know when envelopes were moved from more of wax seals to glue/adhesive seals.